The knurled clip is nickel-plated to resist corrugation. 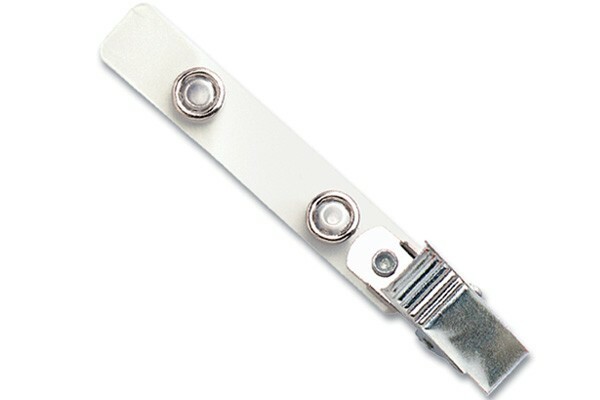 This clear Mylar strap features a nickel-plated steel, knurled thumb-grip clip is an ideal ID attachment accessory to any ID. The metal snaps of the 2 3/4" clear Mylar strap close securely around your slotted ID or access card. The steel, knurled thumb-grip clip allows you to safely clip the strap to your belt loop, luggage straps and other belongings. The clip's knurled thumb-grip ensures that your finger doesn't slip when opening the clip. We ordered these over a year ago and they are still holding up well 15 months in. This product and ID Superstore gets a two thumbs up from me. Ordered these for our ID program, didn't realize I needed slot punches for these. Received a coupon via email for a discount on this and other stuff. Thanks guys!